mairuru: A happy new year!!!! I thank everyone who read this blog, leave kind comments and think of me and Bo-chan. I'm very happy to celebrate the new year with you all. Thank you very much (* v *)!!!! 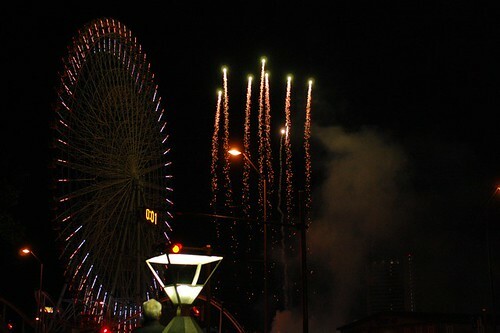 I celebrated the very beginning of new year watching fire works and hearing whistle from ships in the Yokohama Bay. 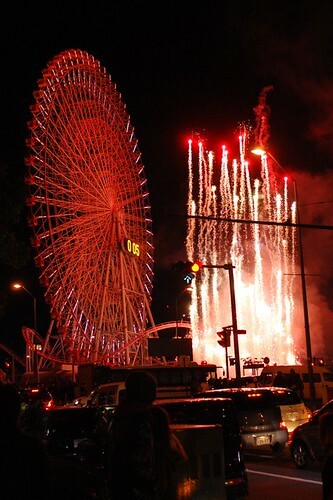 The fire works were held in a amusement park by the bay, and it was crowded very much. So we gave up to enter the park. But the fire works finished only in five minutes...!!!! 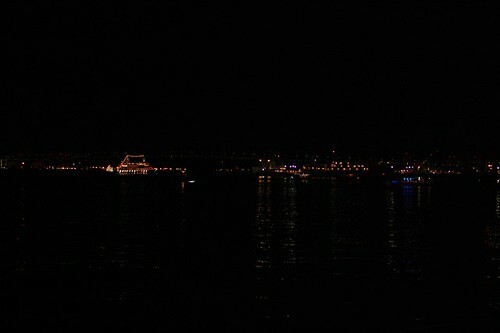 After that, we went to a park by the sea to see decorated ships. I like seeing the bay. It relaxes me a lot. It was 2 hours walk in the midnight. I'm sorry but I don't work these days... What I made recently were only these pouches. I'm writing the tutorial to make them. Please wait for a while. They have two rooms in them but it's very easy to make. I hand sewed them as usual but it took only 40 minutes or so for each. Have a beautiful new year!!!! Happy New Year sweetie! Wishing you all the best for 2010. From a dedicated reader in Canada who really enjoys your blog, I look forward to reading it every day, thank you for all the hard work you put into it! My New Year was one day before yours! Happy New Year Mai and good health to you and yours. happy 2010 to you too! awesome shots, as always.. Happy New Year Mai! Best wishes from Qatar. Have a blessed new year.. HAPPY NEW YEAR, Mai!I wish you all the best!!! Thank you for all the beautifull things you shared whit me since I discovered your blog! I'm looking forward to the tutorial. The bags are very cute! Happy New Year, Mai! What nice views you had for the opening of the new year. Thank you for all the sweet inspiration; your handwork is very fine & special! The pouches are so cute and dainty. Looking forward to another excellent tutorial. Dear Mai, happy new year!! Wishing you and yours many beautiful moments in 2010! Love to you! Those pouches are eye candy and I love the embroidery on them. My goal for the year is at least make one from your tutorial because they are simply adorable. Happy New Year Mai! 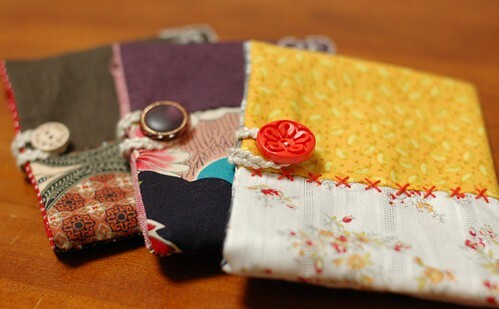 I look forward to seeing how to make those lovely pouches! Happy New Year to you as well Mai. Health, happiness and prosperity to you. Happy New Year! 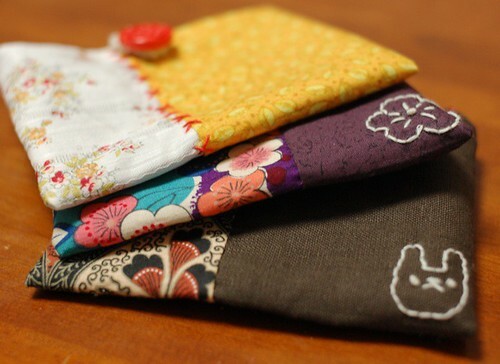 I love your little wallets, you're inspiring me to sit down and do some hand sewing right now. may your dreams come true this year. i happily found your blog through a friend's blog 3 months ago. i think you create and make beautiful pieces. very inspiring for sure! also, it's awesome to see a little piece of Japan through your eyes. Its always a joy for me to read your blog!!! The pouches are so cute! I'll be waiting for the tutorial! I wish you a happy, happy, happy new year! Happy New Year from Maui! I hope your year will be an amazing one! I have just started reading your blog and I think it is wonderful and inspiring! Thank you for sharing all of your wonderful works! and Happy 2010 to you too my dear and thank you for all your inspirational post - I love your sewing! i think I may make some bias tape today! Thank you for sharing your fireworks! I need to do a sweet small project. Your wee little pouches will be perfect. Thank you again. I've been reading all your past posts and your work is really wonderful, I love to see the pictures of all your sewing. Happy New Year! Keep doing lovely things and thanks for all the inspiration! Looking forward to all your new projects. Love the little embroidered details on your pouches. Happy New Year's from Vancouver, Canada! Thank you for sharing and making me want to sew more! Hi Mariru..I just discovered your blog that is so beautiful and full of surprises .. congratulations you are truly an artist! Now start to read everything. Your blog is very beautiful !!! New Year is so important to me... For me, it signifies new beginning, new start, new life... thanks for the wishes.. And my best New Year wishes to all and to everyone! May you all have the best of everything!